What are the factors in Selection of Materials for Engineering Purposes? In manufacturing process selection of materials for the design of a machine is an essential step to accomplish the reliable functionality of the machine. The selected material should satisfy both the availability as well as the function and many other factors. Those are discussed In brief. There are some factors need to be considered while selecting a material for a machine part. 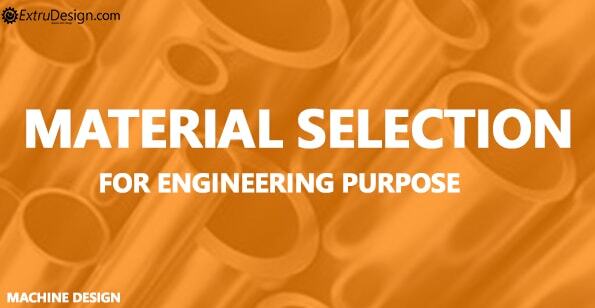 These are the factors need to consider in the selection of material for the engineering purpose. Let’s go with one by one. There are the different type of mechanical forces can act on machine members and produces different stress and strains. These following actions produce the different types of forces in the machine parts. Due to these actions, the following loads/Forces will produce. Due to these loads, different materials can be responds in a different way. These responses will depend on the Mechanical properties of the materials. Following are the different material properties available. Understand the full details about the different material properties here. With the help of these material properties, we can select the material for the suitable application. The second factor in the list is Wear and Tear. As the moving parts or sliding parts needed to withstand the wear and tear as they getting aged. So this is also a factor that makes the difference in selecting a material for the machine parts. It is very important that whether the component should resist the electric current between the two mated components, or it is not necessary to insulate the current. So there are some special materials available to resist the electric current. PVC, glass and asbestos are the examples of Insulation material. These insulating materials can be used in between the mating parts to resist the electrical current. Thermal properties of the materials, that are necessary to consider while picking a material for a machine part. it might affect the mechanical properties of the materials due to the heat. In some applications, it is necessary to insulate the thermal energy to flow between the mating parts. Finally, the most important factor is that the availability of the material resource. From the economical point of view, the material should be easily available in nature. This availability decides the cost of the material. So it is necessary to consider this factor as the major one in the selection of materials for the engineering purpose. By considering these factors, we can select a suitable material that can fulfil the designer requirement from all perspectives such as the functionality, Cost, availability to build reliable machines. These are the different factors that play an important role in the selection of materials for the design of machine members. There are the different classification of materials are available for different application in this Article: Classification of Materials.